It’s that time of the year when we all like to travel and explore the marvels of Europe. But if you’re traveling from the U.S. there are a few things you need to keep in mind. 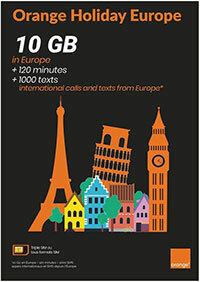 First and foremost, traveling to Europe means you will need a proper prepaid SIM card for europe that works everywhere. Because as it stands, getting international roaming through an American carrier is definitely not going to be cheap. Keeping this in mind, it makes sense to invest a few dollars up in advance to avoid overages and other costs that the carrier may levy on you. Further, there are a bunch of other considerations to keep in mind as well. Data usage, in particular, which will be heavy when you’re in travel mode is something to keep in mind. So taking these things into account, it makes complete sense to get a SIM card that is tailored for your usage so you can simply swap out the SIM card that you have and get using all the data and internet you want. The added benefit to getting a SIM in advance is that you get to choose the duration as well as the amount of data, minutes and texts you will need throughout the trip. So it’s clear by now that it makes all the sense in the world to get a prepaid SIM if you’re traveling to Europe. But which one do you get? Here are seven options. Orange UK is the number one choice on this list for many reasons. First and foremost, the network offers a comprehensive coverage in most countries of Europe and is perfect for a two week vacation to anywhere in Europe. Known simply as Orange Holiday Europe, this pack will set you back by $49.90. In return, you get benefits like 1,000 texts worldwide, 2 hours of calling worldwide, and 10GB of data (with tethering enabled). 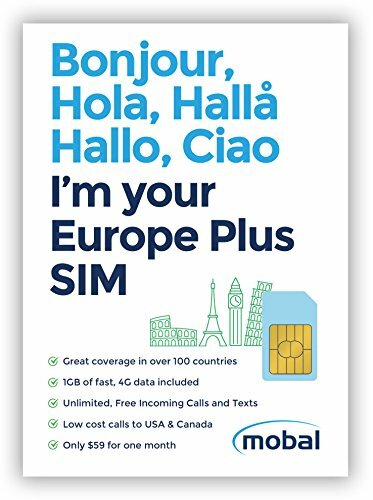 The company lists 30 countries in the EU where this SIM will operate, so you should be well covered regardless of where you’re traveling in the continent. But as we mentioned above, this is only valid for two weeks. So if you’re going on longer trips to the continent, you’re better off considering other options. You can also choose to top-up or extend the validity of your pack (2 weeks) by paying €21.70 which will reset your quota of 10GB data, 2,000 global texts and 2,000 global minutes respectively. One of the primary reasons to consider Orange, especially if you’re traveling to Europe is because of its long reaching connectivity throughout the continent. Finding network in some isolated places can be a problem, as is the case with any carrier in the region, but of all the carriers currently functioning in Europe, Orange is perhaps the best out there. Be sure to check it out. This SIM card is designed for those who travel the world frequently, which in turn makes it suitable for travelers in Europe. It offers mobile coverage in about 200 countries in the world, which we assume works by sharing regional networks in each country. OneSimCard can only offer mobile data in only 160 countries, however, which is still pretty good. The SIM card comes with the option of an European number and an American number, so you can choose the one you prefer. While data is not free, the SIM comes with $10 worth of credit by default. The best part with this SIM card is that you can get free international incoming calls practically anywhere in the world. The same applies for text messages as well, while an outgoing text message will cost you $0.10 each. You can get 5GB of international roaming data for just $29.95 or you might have to eat into your $10 credits with data priced at $0.01 per MB. Voice calling will set you back by $0.01 per minute, which is pretty incredible compared to standard international call rates. Even though the prices appear steep in comparison to the average data prices, you have to realize that mobile data is incredibly expensive when you’re on roaming. The SIM card can be purchased on Amazon for roughly around $40 right now, although we’re not sure when the prices will be bumped again. If you’re seeking a worry-free travel experience especially in terms of mobile data usage, it makes sense to get a SIM card like this that you can use at your leisure without worrying about its validity or expiration date. Three UK is another popular carrier based in the UK and has coverage in the entirety of Europe. This means that you can practically travel the world with this particular SIM card. This prepaid option, known as Prepaid Europe offers several perks for Euro travelers. It doesn’t require a lengthy activation process, so you’re good to go as soon as you slot the SIM into your 3G/4G handset. It comes with 3,000 texts and 3,000 minutes to call with, although it’s only valid if you’re calling to a number within Europe (including the UK) and from Europe. Roaming is free all over the world, although we suggest contacting Three UK for the fine print on this. The carrier mentions that this particular SIM is ideal for using directly on a phone rather than as a hotspot, although there could be device specific solutions to counter this. You get 12GB of 3G/4G data to use with the SIM valid for a period of 30 days once activated on a device. So if you’re making a long trip to Europe, you might consider getting something with a higher validity. You can get this particular SIM card for under $25 on Amazon as of this writing. Customer reviews suggest that this is a great SIM to have, and it’s fairly easy to activate as we mentioned above. Taking this into account, we highly recommend you to try out Three UK for your travels to Europe. Mobal might not be one of the most popular cellular carriers out there, but the prices they offer are really hard to beat. What works for Mobal is the fact that it allows you to stay in touch with your loved ones in USA or Canada at cheap prices without incurring heavy roaming charges on yourself. In addition to offering 1GB of data with the SIM card, the carrier also offers unlimited incoming calls and text messages. While the complimentary data allowance is attractive, customers have to shell out $10 for each GB of data after the cap is reached. This here is a multi-size SIM card, meaning you can use it with any phone regardless of the SIM requirements. Since it’s unheard of to find cellular coverage in remote corners of the world, you might have some trouble with the network connectivity if you’re not in a populous town. But that apart, this is a good SIM to get especially if you like staying in touch with your loved ones at home and don’t need too much data to use during your trip. The SIM is only valid for a month, however, so you will need to top up before the expiration of the first month. Amazon is listing this product for around $59 as of now. GlocalMe is a well known brand across Europe, primarily for their mobile hotspot devices. This is a handy device to own if you don’t want to use a different SIM card on your personal smartphone. This can accept almost any SIM card there is and provide you data in local prices. This is an excellent solution considering that you’ll end up saving a lot in terms of roaming and you simply have to top up your data every now and then to access it on your phone using Wi-Fi. It also has a display on board, so it’s easy to login to your account, check your data balance and even top up if you need to. The company offers cheap data packs sometimes running as low as $1.5 per day, known as Daypass. This is beneficial if you’re going to be out and about each day uploading a lot of content on social media. GlocalMe uses enhanced security protocols to keep your Wi-Fi network safe. The device lets you check the connections currently on your device and also make adjustments accordingly. It can also be used as a dual-SIM mobile hotspot if need be which makes this an exciting proposition for all travelers. So not only can you buy data on the cheap, but you can also choose to go with your own carrier if need be. My favorite feature however is the fact that it comes with a 5350 mAh battery which means it can also be used to charge your existing devices. When kept running all throughout the day, the G3 can last you for up to 15 hours, which is fairly decent. Keeping this in mind, it is recommended to keep this plugged in wherever possible to prolong its usage on battery. You will get download speeds of 150 Mbps and upload speeds of 50 Mbps respectively with the G3. Whether you’re hiking or just visiting a foreign city, GlocalMe G3 is definitely going to come in handy. You can get this for under $170 on Amazon. EE is yet another carrier from the UK which offers excellent data coverage across the continent. Unlike other SIM card providers, however, this is a data only SIM, which means you can use this on a phone for data use only. This makes it ideal for use in a mobile hotspot like device instead of a standalone phone. The company gives a total of 6GB of data to use, with a validity of 90 days which is around three months give or take. The company doesn’t mention a compatibility list for this particular SIM as it works practically everywhere in Europe. The way the carrier does this is by pairing with local carriers in each European country to share their data networks. Moreover, the SIM is pretty easy to use as you simply have to plug it into your device and go about your life. There’s no elaborate activation required, which is convenient if you’ve decided to make arrangements in the last minute. EE is offering this SIM for under $30 at this moment, although the price could shoot up fairly quickly. This is one of my favorite kind of SIM cards as there’s absolutely no hassle about activation or data top ups. That’s because this is the kind of SIM card that you use and throw. If you’re worried about security concerns, well, you can’t make or receive phone calls on this particular offering and it’s used solely for data. You cannot add data once you have exhausted your limited, so you simply have to get a new one. Keeping this in mind, it makes sense to get multiple of these so that you can add data on your hotspot device as you please. This is a 3-in-1 SIM which means you can use it as a micro, standard or a nano SIM, making it compatible with even the traditional SIM ports out there. It works all across the 30 countries of Europe, so you should have no problem with regards to compatibility. The benefits of a SIM like this is that there are no overages or fees if you exhaust data, you simply have to swap out the SIM with a new one. Customers who purchase Cellhire SIM cards have nothing but good things to say about it. Like any other roaming SIM card, it works by pairing with network operators in the region you’re traveling to. You can currently get it on Amazon for around $25, while prices may vary depending on when you buy it. A pretty similar offering as Cellhire, Giffgaff works with UK operators to give you international roaming, particularly within all the countries of Europe. This particular offering however, has limited validity i.e. 12 days. But on the upside, you get access to unlimited data which is capped at around 20GB, so you’re good to go for a period of 12 days. There’s no elaborate activation process involved here and your plan starts as soon as you insert the SIM card on your device. As is the case with any third-party SIM provider, you are expected to get decent data speeds throughout your trip. Keeping this in mind, Giffgaff is definitely an appealing choice for customers who are seeking to save big money on data costs and roaming abroad. It’s important to remember however, that this is only a data offering with no calling or texting ability, so its functionality is somewhat limited compared to a full blown SIM card. While it should theoretically work on every device, it is mentioned on the listing page that this won’t support cellular models of iPads. Given the nature of this particular SIM card, it definitely makes sense to use this on a portable hotspot device. This is a SIM card that is designed for frequent travelers. With lifetime validity, this SIM card can be topped up at your convenience whenever you want to travel to Europe. It also includes several other countries and continents of the world, making it ideal for use practically anywhere in the world. The company provides 1GB of free data with the product which will be valid for one year. Upon renewal of data each year, the validity is pushed to another year. So the term “lifetime” does have some caveats here. In terms of retail packaging, the Keepgo SIM comes packed with instructions as well as a handy SIM ejector tool that should work with most modern day smartphones. As you’ve probably guessed at this point, this is a data only SIM card so it cannot accept or make phone calls or send texts. You can however pair this with Google Voice or any VoIP service like WhatsApp, Skype, Telegram, Line etc to make calls over the internet to people from all over the world without ever having to change your number. Data top ups might be fairly expensive, however, as is the case with any offering really. Amazon is currently offering this product for under $50, but we’re not sure how long that pricing will stick. This is a very interesting choice to be honest, especially if you also want a number to call and send texts the conventional way. Vodafone is one of the most popular carriers in Europe and it’s only fair to pick the best when you’re on your travels. This particular SIM card comes with a £10 credit by default, which can be used for up to six months. The best part is that you get to use all the features practically for free as long as you spend £1 per day. With this, you get unlimited calling, texting and 500MB of data per day. Calling prices otherwise are relatively cheap priced at 1 pence per minute if you’re calling to the U.S. However, you can bypass this by making a call through VoIP which will cost significantly cheaper especially paired with free Wi-Fi. The free data you get can be used as Wi-Fi hotspot as well, so you have practically no restrictions as far as data usage is concerned. The £1 per day spend limit effectively means you get about 5GB of data with the £10 that is supplied to you. This SIM card will set you back by around $25 on Amazon right now, although the prices on the site keep fluctuating. This isn’t particularly a carrier, but one that helps you find the best SIM for your travels. There are two options you can choose from here, both prepaid offerings that will give you 5GB and 12GB of data respectively, which is fairly decent considering the price they’re being offered for. These SIM cards have a validity of 30 days, and it appears to be designed that way with no mention of top ups on the site. However, you get 3000 minutes of calling and 3000 texts with these plans with the only difference being the data allotment and, of course, the prices. It goes without saying that this SIM card supports practically every country in Europe, so regardless of where you’re traveling in the continent, you should be well covered with data, calling, and texts. Bear in mind, however, that the calling is only valid within Europe, so you’re probably going to be unable to make calls to the U.S. unless otherwise specified in the fine print. Don’t hold the SIM for too long, however, as it can stop functioning if it hasn’t been activated for six months. It automatically stops working after 30 days since the first call, text or internet connection. You can get the SIM cards practically anywhere in the world with international shipping available as well. So ideally, you can ship this to a new country where you will arrive during your trip and collect it there. Activation is seamless as it’s plug-and-play, meaning you put it in your phone and get things started. These SIM cards are priced at $29.90 and $39.90 for 5 and 12GB of data respectively, and it goes without saying that the latter option is the better suited for heavy data users. Remember, there is no data top up option here. If you’re going to stay in Europe for more than a month, it makes complete sense to use portable hotspot devices dedicated to give you access to high-speed data in a new country. Be sure to use VoIP calling whenever possible to avoid shelling out calling costs. Not all carriers support free calling to U.S. or Canada from Europe. Data only SIM cards are probably best for short trips as they cover pretty much all the bases. Pick the cheapest data offering to test out the network feasibility while you’re in Europe.